Here you can find a useful guide for solving the puzzles in the game. It contains hints, and step-by-step description of how to find and use the different items to solve the puzzle. It also has combat tips for different enemies and bosses. This guide contains spoilers and is only recommended to read if you are stuck or have trouble with some part of the game. Use it at your own discretion. • The main objective in this zone is to close all the gas valves in the Kitchen to acces the boss. • The valves are spread across the map in different rooms, but one of them doesn't have a valve. • Exploring the level reveals a locked door in the south-west and a stair in the north-west. • Take the stairs and reach the north room with a table with wine bottles. • A book nearby tells that the main door only opens when all the wine bottles have been placed. • All the wines must be of different years for the doors to open. • The wine is stored in the Cellar, down the Kitchen. The [Cellar Key] is in the table, take it. • Take also a [Corkscrew] in one of the tables. • Before you go to the Cellar, take note of the wine's years already in the table. It will be useful later. • Go back to the locked door in the Kitchen and use the [Cellar Key] to open it. • Use the [Corkscrew] to open the bottles. • The bottles are dirty inside, find a bucket of clean water and use the bottles with it. • Now go down stairs located in north-east of the Cellar. • This huge room has a lot of cask full of wine. Each one of different year. • Find the casks with a year different of those wines already put on the table. • Use the empty and clean bottles with the cask to fill up with wine. • When you have the wine bottles of the correct years, go back to the wine table and place them on the holes. • The door will unlock and you will fight a boss. • After defeating them, take the [Gas Valve] and go back to the Kitchen. • Use the [Gas Valve] with the gas tube that doesn't have a valve and turn it off. • When all the valves have been turn, the fires will extinguish and the door to the boss will open. ✦ Avoid the fires on the ground and the fireballs. ✦ Use a [Balm] potion to gain immunity against Burned effects. ✦ The Chef Boss is invulnerable until the four gas tanks are hit with a Boss big fireball. • The main objective in this zone is to clear the rocks to acces the Dungeon. • For removing the rocks you will need [Explosives], they are loctaed in the Armory, one level upstairs (north-est). • The first room in the armory is a hallway full of traps and arrows flying left-right. • Equip and use a shield to block the imcoming arrows while you advance avoiding the spike traps on the floor. • After crossing the hallway, pull the lever on the left wall to disable the traps. • It will only deactivate the hallway traps, the rest of the traps in the level will not be affected. • The [Explosives] are located inside the Armory Vault, in the north-center room. Behind two locked doors. • This doors can only be open with a lever combination, five for each door. • Pull one of the levers, it will broke. You will repair it later. • Explore the map and find 3 [Metal Bar] and 3 [Metal Grip] spreaded in the chests. • But you need a fourth one, so you need to repair the [Broken Lever] you got earlier. • Go downstairs and find a forge where you can heat the metal. Use the [Broken Lever] on it. • Find a [Hammer], can be found across the map in the ground. Look near the forges or crates. • Now you need to cool it. Find a container with cold water and use the [Hot Lever] on it. • Go back to the Armory doors and use the four [Lever] on the empty switches. • In the Armory you can find two books that contains a hint on the lever combination. • One for the left levers and one for the right levers. Use the information to unlock the doors. • It will not tell you the complete solution, only part of it. You will need to try different lever positions. • Once unlocked, enter the Vault and defeat the Black Knight. • Before going down to use it on the rocks, go upstairs in the Armory (north-west). • Now you are in the Barracks. Here you can find a [Map] of the Dungeon. • This part is not really needed, but without the map, will be very difficult to find the Dungeon exit. • Go to the room on the left near the stairs, pick up all the items in the chest. • This items will be used to solve the pillar riddles spreaded across the map. • The [Map] is located in the south-center part of the level. Protected by a energy field. • You will need to solve all the riddles to remove it. • Find a pillar and click on it. It will tell you a riddle. To solve it, use the correct item on it. • Not all riddle items must be used. • Go down to the rocks and use the [Explosives] on them. • The Dungeon is very dark, and very large. Open the Map [M] hotkey, to locate the exit and orientate yourself. • Go to the exit to fight the Executioner Boss. ✦ Look out for spike traps on the floor. It will activate when you pass over them. ✦ Use Fire attacks on barrel/crate bomb to make them explode, damaging neary enemies. ✦ Use a [Potion of Inner Fire] to gain immunity against Frozen effects. ✦ The Executioner will summon skeletons to absorb his life later. Kill all of them before that. • The main objective in this zone is to reach the upper level where the Boss awaits. • Each level is on lockdown protocol. The upstairs are blocked with an energy field. • To deactivate it, you will need to press a number of buttons on the ground spreaded across the map. • To do it, simply walk over them and stay on it one second. It will turn green when activated. • Each level has a different layout and the number and position of the buttons are random. • Explore the maps to find books containing information about fuses. • There are three of them, one in each level. Will be useful later. • Upon reaching the fourth floor you will need to solve a fuse puzzle before continue to the Boss. • To solve the puzzle find the three fuse panels. Each one has a energy meter on his right. • Click on the meter to see the current energy level and the correct energy level needed to solve it. • You will need to use the correct fuses to reach the correct energy level. • It starts at 250 energy, using a fuse on the panel will change the energy depending on the fuse. • Some adds energy, others substract, doubles it or halve it. • This puzzle is very difficult without the hints of the three books earlier. • Each book tells you the position and the type of two fuses on each panel. • A simple math problem. Solve the three panels and go upstairs. ✦ Be careful when passing between the lightning towers. It will stun you a brief time. ✦ Destroying Electric cells will deactivate a random lightning tower nearby, but will free an Electric Elemental. ✦ Use a [Potion of Isolation] to gain immunity against Stun effects. ✦ The Mecha Boss will deploy a energy shield when low life. It dissapear after a few seconds. • The main objective in this zone is to open the Emerald door on the north room in the Gallery. • This door only opens when seven [Emeralds] are place on it. • Explore the Gallery and look for stone statues. Three of them has a [Emerald] on it, take them. • Go upstairs to the Libray. Then go to the north-center room and defeat the boss. • Before going to another level, explore the Library to find 10 books containing the rune combination of rooms. • This books will be useful in the upper lever, the Archives. • In this level there are 10 locked rooms. In three of them there is an [Emerald] in a chest. • Find the roman number of each room and the right rune combination reading the books. • After you find the 3 [Emeralds] in the rooms, go upstairs. • Now you are in the Laboratory. One of the doors are blocked with a huge moss. • To remove it, you will need to mix some vials. • Next, find a book/note that contains the Herbicide Formula. Which tells the right color vials to mix. • Use the [Herbicide] on the moss and open the door. • Continue to the last room and pick up the last [Emerald] in the chest. • Go downstairs to the Gallery and use all the 7 [Emerald] on the door. ✦ Thorn Bulbs will explode if you kill them or walk nearby them. Shooting poison thorns in all directions. ✦ Kill the Alchemists before they start to drink his potions. They will transform in powerful Beasts. ✦ Kill the Beehives first or more bees will come to attack you. ✦ Use an [Antidote] to gain immunity against Poison effects. ✦ The Golem Boss will petrify and regenerate life as long there are enemies statues left. • Use the four [Pure Essence] on the arcane pillars in the Main Hall. • After activating all the pillars, a Boss will apppear. • This boss will change his attack elements from time to time. • You will need weapons and armor enchanted with [Elementium] to deal with him. • He also teleports to a nearby location if you get close enough. • After defeating him, you will gain the [Light Essence] and the Light Spells. • A portal to the Final Boss will open. Be sure to be prepared before entering. • While fighting the boss, it will summon different dark type enemies. • Use Light spells and Light weapons to defeat them. • They are immune to other types of damage. • Two times per fight, he will make himself invulnerable behind a magic barrier. • The barrier can be removed by destroying the 3 pairs of crystals spreaded in the map. • Don't attack the crystals near the barrier, they cannot be destroyed. • Follow the trails that leads to the vulnerable crystal and attack him with the same element. • At low life, the boss will initiate the third and last phase. Creating a Black Hole. • It will attract you and your ranged attacks towards it. If you get close enough, you will die. • Move around it and destroy the dark crystals, they eliminates any proyectile or spell you cast in his range. • Cast LIGHT spells to the Black Hole to damage it. • Destroy the Black Hole to defeat the final Boss and complete the game. ✦ Cast Light Swords spell upon you to create a temporal blind field around you. ✦ The Boss is invulnerable while has a fireshield around him. It dissapear after few seconds he cast a fire nova. • To open the doors you need to solve four mini-puzzles. • Read the [?] sign in the center fo the room to learn how the puzzles work. • The levers puzzle is solved when all the levers are down. • Be aware that some pulling some levers may activate others. • The "Simon" puzzle is exactly as the name suggets. Click in the center button to activate. • After a short delay it will shown a serie of colors (and sound). You need to reproduce them in the same order. • If you fail, click on the center again. The solution will be different each time. • Only after activating all of them you will know if it's the right solution. • The hints tell you the partial order in which the braziers must be light. • You know witch one is the third, which one is NOT the fourth, and which one can be first or second. • Using logic you will know that the only brazier that is not mention in the clues, is the fourth one. • Now we know the third and fourth braziers, you have to try a couple combinations of the remaining ones. • The last puzzle (3x3 grid) is solved by "drawing" a pattern on it by pressing the buttons. • The pattern is one of the gorund glowing symbols. If you look closer, the symbols is in a 3x3 grid. • You have to activate the buttons that have a line over in the pattern. • After solving all four puzzles, open the chests and grab all the elemental essences. • The doors will open after. • On this floor you have to go from one room to another in the correct direction, until you reach the exit. • Read the [?] sign and take note of the directions. • Be careful, not all the directions are correct. Only the directions when the protagonist is walking to. • Don't take note on the directions where he is looking at, or describing something. • Finally the last direction will be the same as the first one. 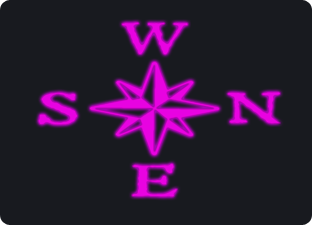 • You have to orientate with the big compass rose in the ground. • So if it's marking East(E) at 6 o'clock on the screen, you need to go "south". • The puzzle begins when you cross the first door leaving the compass rome, not before. • For example, let's say you come up with E-W-N-N-E-SW-E direction after reading the clues. • Each room has 4 doors, but the last 3 rooms will have 8 rooms (NW-NE-SW-SE) be careful wich one you choose. • If you pick a wrong door, you will return to the beggining (compass rose room). • Read the [?] to know the rules. • It will tel you the Keyword to cross safely. • There are two rules. First, only the cells with a letter contained in the Keyword must be used. • The letters between two movements doesn't matter, only the start and end letter of the move. • And finally, your first cell must have a letter contained in the Keyword. • And the next will be [U]. Repeat the same process until reach the other side. • Keep in mind the L movement rule must be followed. • If you break the L movement or end in a letter that is not contained in the Keyword, you will die. • In this level you must face four survival test. • There are four big rooms connected between. In each one there's a button in the center of the room. • Activating the button will close all doors and start a timer in the upper part of the screen. • You must survive until the timer ends. Then the doors will open again. • Each room has traps and will spawn different enemies once the timer is activated. • Is recomended to save the game when you pass one test. • When the four survival test have been passed, the center room will open. • Go there to the next level. • This level is a little tricky. It requires some coordination and timing. • A magical one-eyed creatures that doesn't like visitors in his dimension. • Fortunetly for us, they have his vision sight reduced. They only see in front of them. • The range is indicated on the ground, if you are inside, they will attack you. • The puzzle is simple, press the color buttons to disable the lasers of the same color. • If you cross a laser, all the [Beholder] nearby will attack you and the exit to the next test will close. • Some [Beholder] follow the same route and make the same stop time before continuing. • Learn they movements and disable the different lasers colors to clear a path. • Use the only two [Save Points] in the level before advancing further. • Defeat him in battle to become a Master Alchemist. • This fight has some of the same traps in the survival floor. • Use everything to stay alive and avoid the traps and enviromental damage. ✦ Don't try to rush it. Take some time and think what is the best action. ✦ Use any potion to give you an advantage in battle. ✦ The puzzles are hard but not impossible. Use logic to solve them.